Windows Phone users who have been testing Microsoft's Windows 10 Mobile beta operating system were given a little present heading into their weekend with the release of a new build Friday. Build 10166, which was pushed out to early adopters in the Windows Insider Program, doesn't promise new features. Instead, the new release focused on fit-and-finish changes, as well as fixing a number of bugs that have plagued Windows 10 Mobile. In a blog post announcing the release, Microsoft Engineering General Manager Gabe Aul said that phones will now properly show a notification message that's supposed to appear up at the tail end of the software update process. That message has been missing in the most recent builds. The update also includes a fix for a bug involving a phone's trusted platform module that locked up phones in rare cases. To fix the problem, users were instructed to let their phones sit unused for an hour or two before trying to sign in again. The Windows Store received a couple of improvements in the new build: It lost its beta designation -- now that Microsoft has removed the old Store app -- and downloads from the store are now more reliable. Past builds of the store have suffered from reliability issues during downloads, so the improvements will likely be a welcome addition for Windows 10 Mobile users who want to download new apps or update those they already have on their phones. Finally, users who were frustrated by the size of the battery icon will be happy to know that Microsoft has increased it in the latest build. It should now be easier to figure out how much of a charge a phone has left in it without squinting. Microsoft's decision to move away from releasing new features in this build is a curious one, because Windows 10 Mobile isn't slated for release until the fall. It's unclear what drove the push for bug smashing in the most recent build, and what this means for the operating system's future feature set. 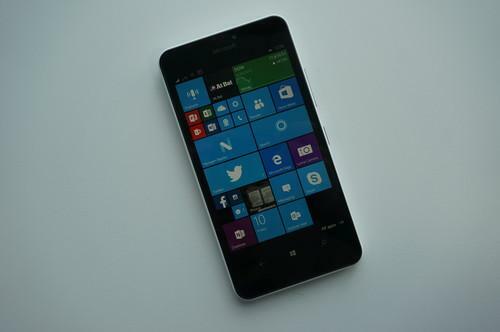 The new build comes at an interesting time for Windows 10 Mobile as a platform. Earlier this week, Microsoft announced that it was cutting back on its smartphone manufacturing ambitions and slashing about 7,800 jobs. Instead of creating a wide spectrum of devices, Microsoft will be making a smaller number of smartphones focused on a few key market segments, which has some industry watchers questioning the future of Windows on smartphones.